What makes you happy? Happiness comes from achieving your values: pursuing a career you love, a romantic relationship, perhaps raising a family, or running a successful business. According to Ayn Rand, “happiness is that state of consciousness which proceeds from the achievement of one’s values.” But how does one know what values to pursue and how to achieve them? This is where ethics comes in. Fallible beings—we humans—don’t know automatically what values to pursue and how; ethics provides the guidelines. The first question in ethics is “what values should I pursue?” Is it my own life and happiness, or should I put others’ interests first? The second question is the “how:” How do I achieve my values? Virtues provide the answer to the second question; they are the actions necessary to achieve values, and they of course vary significantly, depending on the answer to the first question. For many people, “virtue” conveys a chore or a duty—because they have accepted serving others as the answer to “what values should I pursue?” They follow the conventional morality of altruism that identifies actions such as charity, compassion, tolerance, and humility as virtues. According to altruism, such virtues are the means to a good life. However, if we adopt “my own life and happiness” as the answer to the first question in ethics, the virtues guiding our actions look very different. It is our selfish interests of survival and flourishing that define virtuous action; therefore, the virtues are derived from the requirements of human survival. Lacking speed, strength, claws and fangs, we survive primarily by thinking; therefore, the primary virtue is rationality, or exercising reason (as recognized both by Aristotle and Ayn Rand). The rest of the virtues for human survival and flourishing, as identified by Rand, are aspects of rationality: productiveness, independence, integrity, honesty, justice, and pride. (Note that she didn’t consider this an exhaustive list). 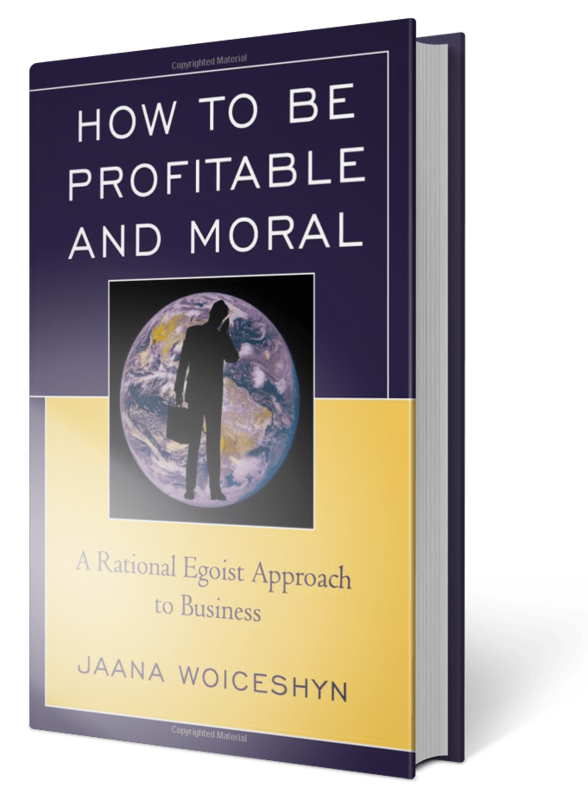 · Productiveness, the production of material values and the core purpose of business firms, is a selfish virtue because material values are necessary for our survival. Most of them do not exist readily in nature but have to be created: buildings, clothing, meals, medicines, cars, computers, cell phones, and so on, can only be created by applying reason to the problem of production.—Consider the alternative of producing nothing, or trying to produce something without thinking. · Independence is a selfish virtue because to achieve our values, we have to think for ourselves and are responsible for supporting ourselves (obligating others to support us would violate their right to live their lives and pursue their values).—As an alternative to independence, try following others blindly. · Integrity, acting consistently on principle, is a selfish virtue because values can only be achieved by the guidance of principles.—Try compromising rationality and make a decision based on tarot card reading instead. · Honesty is conventionally understood as truthfulness with others. But it is a selfish virtue because achieving your values requires adherence to that what is real and rejecting any faking.—If you are not convinced about this, try pretending your cash flow is sufficient when it’s not. · Justice is a conventional virtue but is required for selfish reasons also: we must judge other people and trade only with those who are rational, if we are to achieve our values.—Try loving everybody equally and hiring everybody who wants to work for you, without any screening. · Pride is conventionally understood as a sin, but it is a selfish virtue. It means moral ambitiousness: doing your best in whatever you choose to do. First and foremost, this means unbreached rationality: applying reason consistently. This is possible and necessary—if we want to achieve our values, such as a successful business and a happy life, in the long term. Following selfish virtues leads to achievement to our values but it does not permit exploiting others. Exploiting others—which violates all the virtues discussed above—does not create but destroys values, as all exploiters from Charles Ponzi on eventually discover.